Attractive shrub with a tight bushy growing habit. 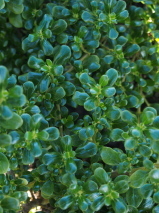 Highly glossy dark green leaves on erect branches. Lovely as a low hedge. Will grow in most situations and soils, though avoid very heavy frost. Grows well in coastal or exposed sites. Discovered at Middlemore Hospital.